The Japanese designers Shin (born 1965) and Tomoko (born 1966) Azumi are recognized for developing some of the most sophisticated and savvy pieces of furniture to exist within the Mid-Century modern period. Their lucrative partnership first blossomed in the Kyoto City University of Art, where the couple first met and formed a romantic relationship, later leading to marriage. When the couple found each other, a new aesthetic dynamic was created through work designed to change “people’s behavior in a subtle way”. In more practical terms, this concept of simplifying the lives of their customers can be seen in the way they placed the holes of their 1996 salt and pepper shakers lower than usual, to encourage gentle tipping instead of vivid shaking to access the contents. What’s more, the compact and versatile table chest piece that was produced in 1995 offers a quick, space-saving method to convert a low table into an elegant cabinet and vice versa. The Azumi brand was formed in 1995 and through this brand Shin and Tomoko began establishing themselves within the pages of the design world by creating limited edition Mid-Century modern pieces for production and winning commercial commissions. Typically, the pair focused on creating pieces that could be produced in small quantities and through economic methods – such as the conceptually ingenious, but apparently simple tables, chests, and benches made from industrial materials inspired by 3D wire computer images and supermarket baskets. The primary terms used to describe Shin and Tomoko Azumi revolve around simplicity and surprise and the couple consistently evoked playfulness in their products alongside a theatrical quality within the core of their design. Much of the furniture that they produced is converted in character and form and made using simple ideas intended to emphasize movement. Both in a material sense and beyond to the immaterial, Shin and Tomoko Azumi have dedicated their exploration of design, furniture, and art to creating a new method of using objects according to their optimum function. Through their years in the field of design, the pair has experimented thoroughly with materials in an attempt to provide a tactile quality in their designs. From spaces to objects, the Azumi couple has consistently expanded their territories for design, all the way from objects, to interior design concepts, and even architecture. Tomoko and Shin Azumi have delivered innovation into a wide variety of products, from subwoofer speakers, to the everyday salt and pepper shakers, tables, and of course, the LEM Piston Stool in the year 2000. The LEM Bar Stool was named product of the year by the FX International Interior Design Awards during the year of its release and today it is recognized for its original and rigorous rethinking into the function and form of seating. 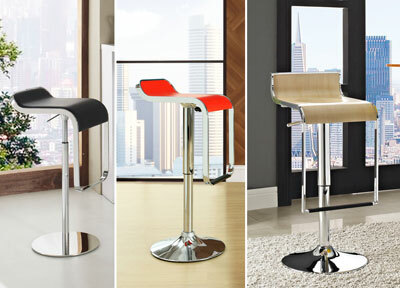 An iconic chair, the LEM Bar Stool features a sinuous seat attached to a metal pedestal base. The footrest, also constructed out of metal, flows from the frame of the seat establishing an elegantly liquid form that transcends both trends and time. The sculpted seat of this Mid-Century modern furniture design swivels and adjusts easily from counter to bar height with a lever which activates an effective gas cylinder. Though utility is the aspect which determines a large majority of its form, this unique stool also utilizes a visual lightness that offers the user a sense that they are free from the confines of gravity. 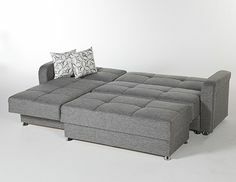 The steel frame extends downwards and doubles as a footrest, designed in such a way that the footrest and seat are always a comfortable distance apart from one another. “A loop which is floating in the air”, this iconic bar stool produces visual illusions that entrance people who use and see it. The significant void of space within the structure of the loop allows for a gentle and engaging relationship between the surrounding environment and the chair itself. After Shin and Tomoko Azumi designed the LEM piston stool, they both continued to develop lighting, interiors, and furniture for clients around the globe. The LEM Stool is now included within the permanent collection at the Victoria and Albert Museum. When Shin and Tomoko Azumi set up their studio in 1995, they merged their differing backgrounds, marrying just before they moved to London, and continuing to work closely thereafter. Although the two certainly have their own interests, many interviews and conversations with the pair have revealed that they share similar thought processes and concepts regarding Mid-Century modern design. 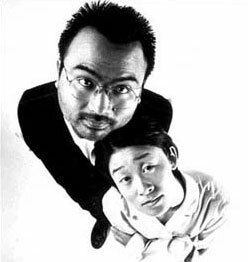 According to Shin, collaborating with each other has always been a simple process for the Azumi couple and their direction focuses on making current designs better. The focus of the Azumi approach to projects functions around a close observation of the way that people in regular society behave so that existing designs may be improved and tailored to those behaviors. Not only do their designs break the mold when it comes to aesthetic appearance and artistic design, they also serve to make life subtly simpler for those who use them. Shin and Tomoko Azumi consistently evoke playfulness through the products that they produce alongside a permanent theme of simplicity and surprise. Today, the items that they have developed over their years designing together continue to appear as pivotal features in homes, offices, and buildings around the world. Now, Tomoko and Shin Azumi have a cemented place within the history of Mid-Century modern design and their works inspire the designers of today to think harder about the way products can be built. Indeed, the Azumi couple provides proof to the concept that just because a particular concept is “common” doesn’t mean that it’s the best it can be. Traditional design ideas can always be improved and Shin and Tomoko Azumi aimed to find that improvement in every aspect of their work. This entry was posted on Wednesday, April 8th, 2015 at 11:30 am	and is filed under Mid-Century Designers. You can follow any responses to this entry through the RSS 2.0 feed. Both comments and pings are currently closed.